Well Above Average: Separated at Birth? Am I the only one who sees a striking resemblance between Stewie of Family Guy and Sheldon of The Big Bang Theory? Like they could be related or something. 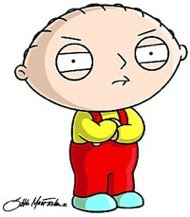 If Stewie weren't a cartoon. Is the Big Bang Theory good? Everyone I've heard talk about it seems to really love it. 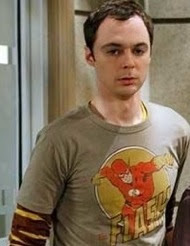 Sheldon: I'm polymerized tree sap and you're an inorganic adhesive, so whatever verbal projectile you launch in my direction is reflected off of me, returns to its original projectory and adheres to you. I think you'd love it, too. Lots of great vocabulary.